As of May 2016, Vellum is no longer sold through the Mac App Store (see our blog for details). To receive future updates to Vellum, you will need to migrate to the Direct version. To migrate, first remove the Mac App Store version of Vellum and then install the Direct version. This process is completely safe: it will not affect your purchases or saved documents. 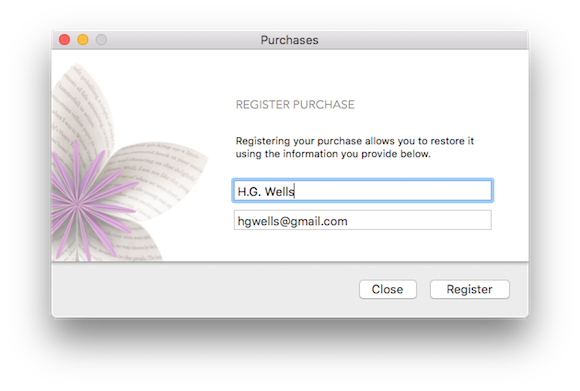 Before removing the Mac App Store version of Vellum, we recommend registering any purchases you have made. Registering ensures that if you ever lose data on your computer, or buy a new Mac, you can easily restore your purchases. Once you have entered in your full name and email, press the Register button to complete registration. You should find Vellum in your Downloads folder. When the download is complete, please move Vellum to your Applications folder.